Call us. We can help! Contractor Rush understands the value of relationships. Below are links to some of the organizations Contractor Rush has partnered with as well as some leading industry associations designed to meet the needs of Contractor Rush customers and interested parties. 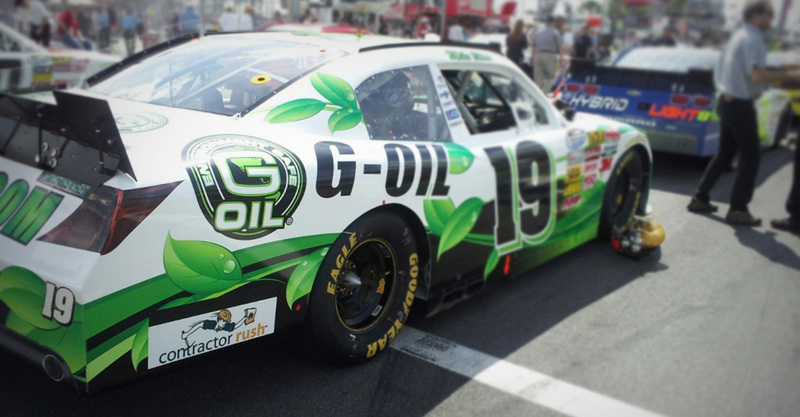 Contractor Rush had the privilege of being an Associate Sponsor for the TriStar Motorsports number 19 G-Oil Car in the NASCAR Nationwide Series DRIVE4COPD 300 Race at Daytona International Speedway. Mike Bliss was the driver for the car and and lead the 87th lap of the race and ultimately finished 23rd. Follow TriStar Motorsports and Contractor Rush at other Nationwide events during the season. Contractor Rush is thrilled to be part of the team as Jason lives his dream of being a race car driver. Jason currently races in both NASCAR Truck and Nationwide series. The mission of the American Council for Construction Education (ACCE) is to be a leading global advocate of quality construction education programs and to promote, support, and accredit quality construction education programs. Associated Builders and Contractors (ABC) is a national association representing 23,000 merit shop construction and construction-related firms in 79 chapters across the United States. ABC's membership represents all specialties within the U.S. construction industry and is comprised primarily of firms that perform work in the industrial and commercial sectors of the industry. The Cool Roof Rating Council (CRRC) is an independent and non-biased organization that has established a system for providing Building Code Bodies, Energy Service Providers, Architects & Specifiers, Property Owners and Community Planners with accurate radiative property data on roof surfaces that may improve the energy efficiency of buildings while positively impacting our environment. The Metal Roofing Alliance was formed in 1998 by a small group of forward-thinking metal roofing manufacturers with the main goal of educating consumers about the many benefits of metal roofing. As the voice of the remodeling industry, NARI has an inclusive, encompassing purpose: to establish and maintain a firm commitment to developing and sustaining programs that expand and unite the remodeling industry; to ensure the industry's growth and security; to encourage ethical conduct, sound business practices and professionalism in the remodeling industry; and to present NARI as the recognized authority in the remodeling industry. NAHB is a Washington, D.C.-based trade association whose mission is to enhance the climate for housing and the building industry. Established in 1886, NRCA is one of the construction industry's oldest trade associations and the voice of professional roofing contractors worldwide. RCI, Incorporated is an international association of professional consultants, architects, and engineers who specialize in the specification and design of roofing, waterproofing and building envelope systems. The Vinyl Siding Institute offers a certified installer program, webinars for AIA Continuing Education Credits, and multiple installation resources including manuals, videos, and answers common questions. When it comes to software for residential construction management, Contractor Rush records and backs everything up. It produces and tracks RRP records, contractor completion certificates, contingency contracts, commission reports, and punch-out sheets to document and store all aspects of your construction business. Contractor Rush is a project management system that can perform on many digital platforms. Both standalone and web-based versions are available. Web-based versions are backed up to a server eliminating the headache of lost information. You no longer have to worry about losing info on your remodeling projects and reports. With Contractor Rush, all of your residential remodeling estimates and bids are entered directly as the sale process proceeds and prints all of your contractor forms with correct data with your company logo. Our construction management software reduces hours deciphering hand-written notes, making your business run more efficiently. Contractor Rush is a residential construction management software designed specifically for contractors by contractors. It is based on successful business models used by residential remodeling contractors within the home improvement industry. The software is successful, trackable, traceable, and delivers results. Contractor Rush is the one-stop construction management software solution for you home improvement business. Whether the business requires window installation software, siding software, roofing software, garage door software, gutter software, or soffit software, this construction management program can handle it all.